I don't know whether I should call it a craze or an obsession (I get plenty of them!) 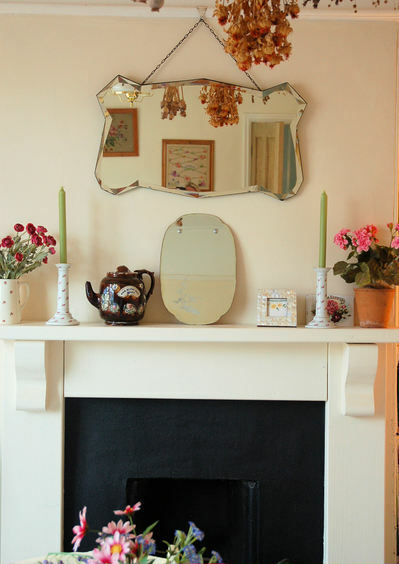 or if it is just a new fad; but I have recently been searching for, and being outbid (grr) on vintage, bevelled mirrors. I can pin point when this obsession started and I know who is to blame...Atlanta Bartlett. There have been quite a few articles about her wonderful home over the last 6 months and I am totally hooked. She and her husband run a locations business and her home, Foster House is one of them available for photo shoots. 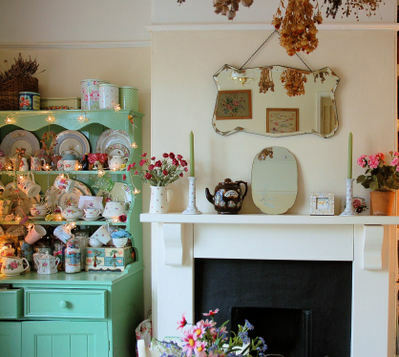 I just love, love, love it (I find myself perusing the 43 photos more times than is probably deemed healthy) and now find that I recognise it straight away in all manner of magazines. Anyway, Atlanta uses these mirrors in many ways - my favourites being this and this and this and I was so inspired I thought I would try to do something similar. Yeah.. alright I hear you....copy! I have already used her idea of glass cake stands for the girls' jewelery. Ooh, what I wouldn't give to pay that house a visit.. It's been harder than I imagined. There are quite a few on ebay but being very heavy the cost has been quite high, even so I have been outbid every time. But I finally found one in Ludlow for only £3 (as it has woodworm though it's been treated now) and earlier today I moved the knitted Home Sweet Home picture and replaced it with my new mirror. I wasn't going to hang it but just prop it up (very Atlanta) but there was a hole in the wall so it had to be hung. So there we have it, my new passion. I would like a wall of these mirrors and even tried to persuade Lucy and Alice to have some in their newly decorated room. Alas I am still only the owner of one, (and a sort of one) so that wall might take some time in materialising. I'll just keep searching and stare at Atlanta's every now and then!